I'm looking for a dataset of human translated sentences. 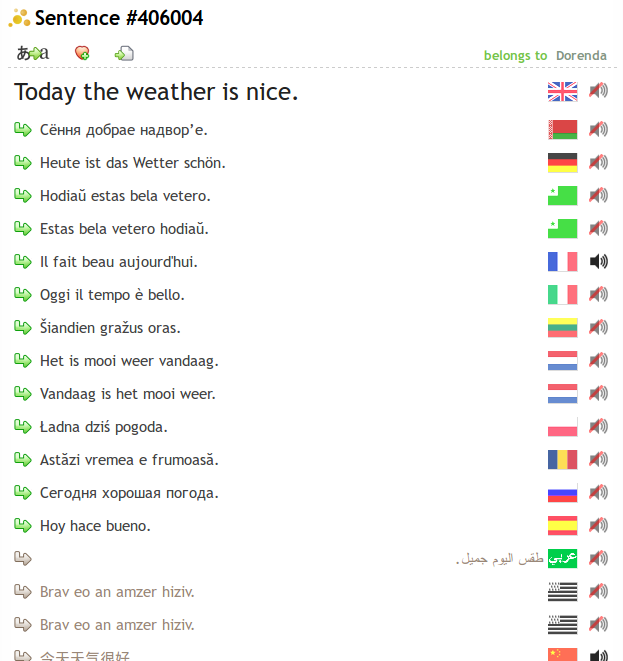 1, en, The weather is nice today. 1, de, Das Wetter ist heute schön. 1, es, El clima es agradable hoy. 1, el, Ο καιρός είναι καλός σήμερα. for as many languages as possible and for sentences of varying length and complexity. It's important that the text is human translated. An existing dataset or database would be great, but I can also scrape websites or hook up to an API. Note: I've suggested Anki for these types of questions (one, two), but that doesn't work well in this case because it's 2-languages only. Their data is human-edited and used by dozens of products/websites including electronic dictionaries, so it is of reasonable quality. It has 471468 English sentences and 179 languages. The structure is not a simple 1-1-1, a sentence can have several translations. The whole data is open (Creative Commons CC-BY) and downloadable at http://tatoeba.org/eng/downloads in various formats. One option would be to use movie subtitles. As described here, OpenSubtitles.org can be used to find parallel text in many languages. Have you considered using some book that's been widely translated, but is out of copyright? The bible comes to mind, as the verse numbering scheme would make it easy to match up sentances. Some translations may still be copyrighted (eg, the NIV), but older translations like the King James would be out of copyright. Not the answer you're looking for? Browse other questions tagged data-request language or ask your own question. Is there a free list of English word phonetics? Dataset of Sentences Classified by Type? Download OpenOffice/Hunspell dictionaries (.oxt / .dic+.aff) for many languages at once?